Move over peanut brittle, there’s a more exotic candy in town. 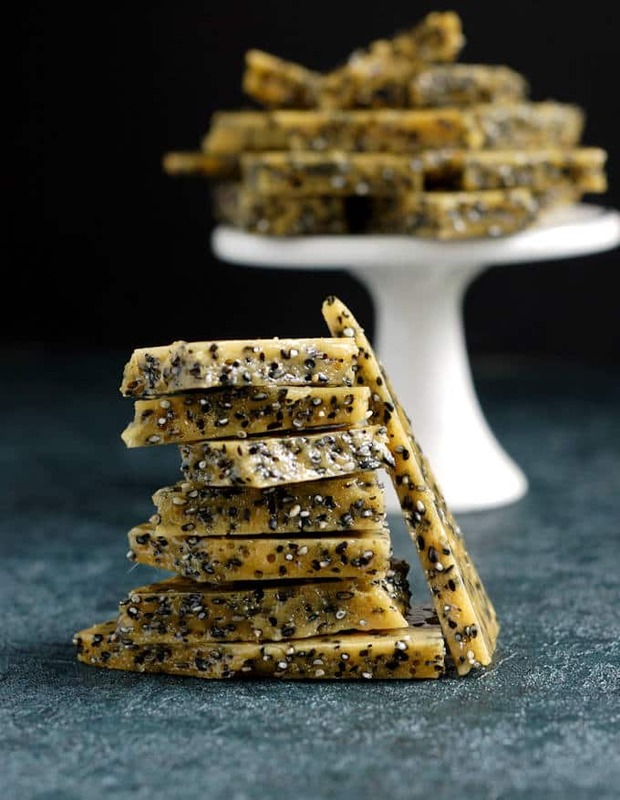 Black Sesame Seed Brittle is a candy for grown ups. If you’ve never made candy at home, you’ll be shocked how easy this recipe is. It seems I’ve been on a bit of a sesame kick lately. 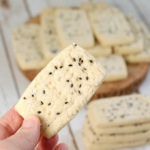 Just a few weeks ago I posted a recipe for Tahini Shortbread and last week I found a jar of black sesame seed paste when I was cleaning out the pantry. Since I had so much fun baking with tahini, I wanted to see what I could do with black sesame paste. I bought the jar of black sesame paste on my last trip to my favorite Asian supermarket in Philadelphia. I had no idea what I was going to do with it when I bought it. I tend to make way too many impulse purchases when I shop at an ethnic market. I’d seen some recipes for black sesame ice cream and thought that would be a good place to start. 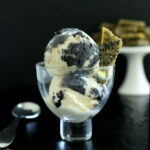 When I started writing the ice cream recipe I thought about adding a crunchy element with black sesame seeds. Maybe some sort of brittle? Well, the ice cream testing wasn’t going that well and the recipe needed more work. 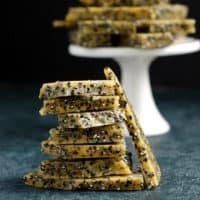 In the meantime, I decided to make Black Sesame Seed Brittle and post the recipe, since I now had the idea for it in my head. Unfortunately, once my brain starts working on an idea it’s hard to switch it off. 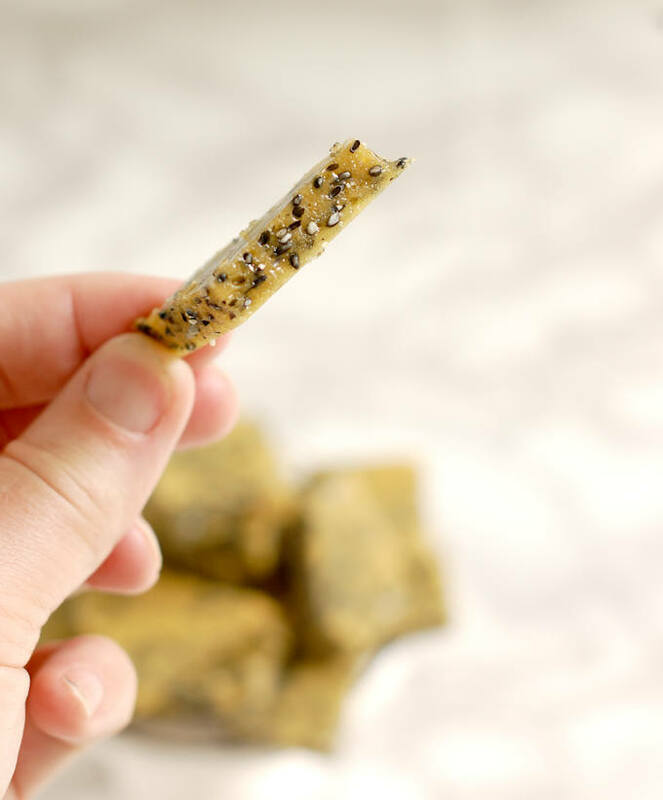 If you’ve never made candy because you’re afraid of working with sugar syrup, this Black Sesame Seed Brittle is a great introduction to candy making. 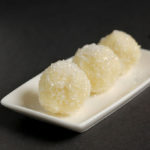 The biggest problem when working with sugar syrup is controlling how the sugar crystallizes. This recipe starts with a combination of water, sugar, cream of tartar and corn syrup. Both cream of tartar and corn syrup inhibit the formation of sugar crystals. So you’re already on your way to candy-making success. Then there’s the matter of how long to cook the sugar syrup. 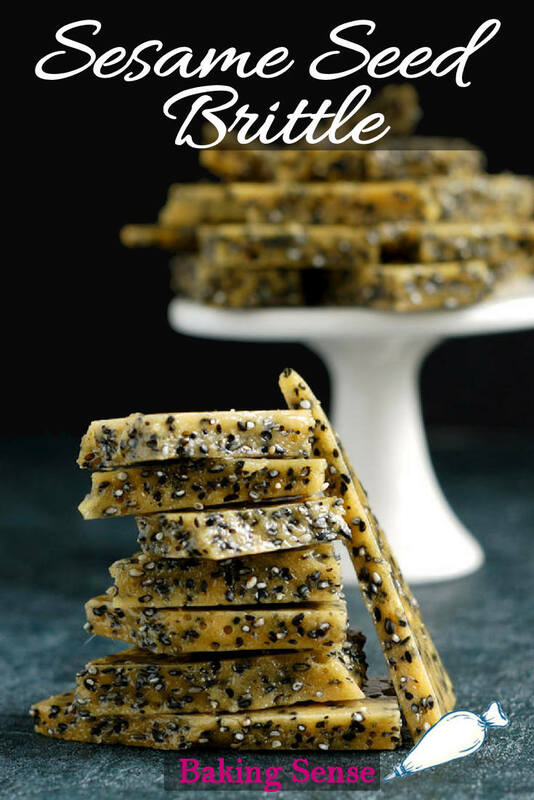 Anyway, you can make Black Sesame Seed Brittle even it you don’t have a candy thermometer or probe thermometer. The reason we use a thermometer to monitor the temperature of the sugar syrup is that the temperature directly correlates with how much water is still in the syrup. Lower temperature means more water and higher temperature means less water. Having too much or too little water in the syrup can ruin a recipe. If you’re making a clear, hard candy like a lollipop you need a thermometer to tell you the syrup is at the “hard crack” stage. If you don’t boil the syrup long enough your lollipops will be soft and sticky. Good news! For this recipe we want the sugar to caramelize. The caramel stage happens when all the water has cooked off and the sugar starts to turn brown. Since we can see by looking at the sugar that it’s reached the caramel stage, a thermometer is not required for making brittle. You can just keep an eye on the boiling sugar and turn off the heat when the color becomes a golden caramel. Once the sugar is golden brown you’ll stir in the butter, sesame seeds and a little baking soda. Those are the ingredients that make this a brittle and not just a hunk of caramelized sugar. 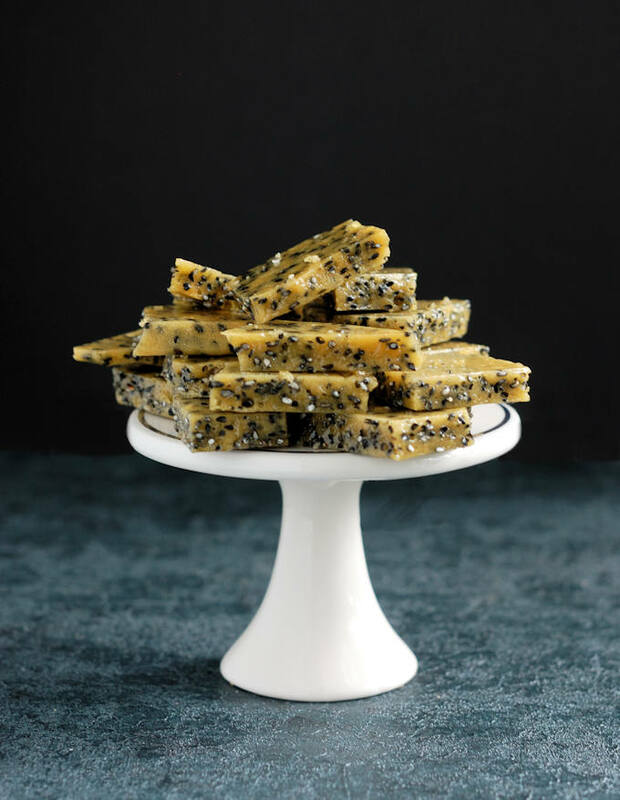 The butter adds a little richness to the candy and the sesame seeds add texture and flavor. When the baking soda is added to the caramel it releases thousands of tiny carbon dioxide bubbles. All those little bubbles get trapped in the caramel and aerate the candy. Move over peanut brittle, there's a more exotic candy in town. 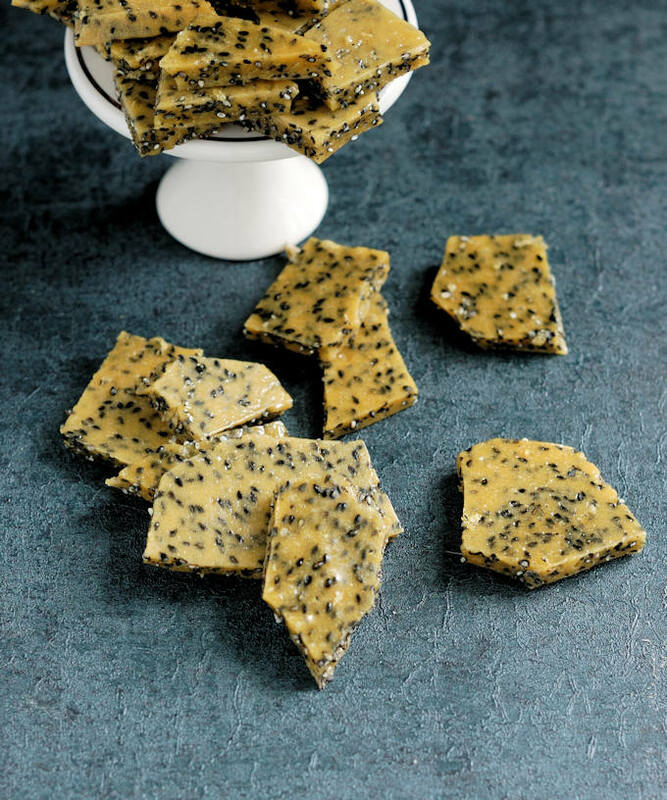 Black Sesame Seed Brittle is a candy for grown ups. 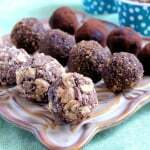 If you've never made candy at home, you'll be shocked how easy this recipe is. Line a baking sheet with a silicone baking mat or parchment paper. You can also butter the pan if you don't have a baking mat or parchment. Combine the water, sugar cream of tartar and corn syrup in a heavy saucepan. Stir the mixture until it begins to boil. Once the mixture starts boiling do not stir. 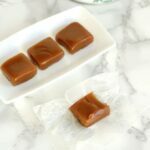 Cook the sugar until it becomes a golden caramel color. If using acandy or probe thermometer set the temperature to 350F. Remove the pan from the heat and immediately stir in the butter, sesame seeds baking soda and salt. Pour the mixture onto the prepared pan and spread it to an even layer. Set the brittle aside to cool completely and harden, about 30 minutes. Peel the sheet of brittle off the pan and set it back down. Use a heavy meat tenderizer or other heavy tool to crack the sheet into shards.